Hyundai Motorsport is eagerly anticipating the start of the FIFA World Cup which gets underway with an opening ceremony at the Arena Corinthians in Sao Paulo, Brazil tomorrow. The FIFA World Cup is an important global sporting event for Hyundai, as it has been an official sponsor of FIFA since 1999. This year will be the fourth consecutive FIFA World Cup sponsored by global car manufacturer following 2002, when the World Cup was held jointly in Japan and on Hyundai’s home soil in South Korea, to Germany 2006 and South Africa 2010. 2014 has already been a stellar year for Hyundai’s global sporting involvement with its WRC debut falling in the same year as the FIFA World Cup. Both major competitions enable Hyundai to convey the excitement and passion of its growing brand to global audiences. The Hyundai Motorsport squad will be following the 2014 FIFA World Cup intently while it prepares for the next round of the WRC season in Poland later this month. The team has divided loyalties for this year’s tournament with 24 different nationalities represented across the company’s 100-strong workforce. Among the team drivers alone there will be friendly rivalry as Belgium’s Thierry Neuville, Australia’s Chris Atkinson, Spain’s Dani Sordo and France’s Bryan Bouffier all hope for bragging rights. Hyundai Motorsport’s Korean staff will undoubtedly be keen for South Korea to triumph while the locals in Alzenau will be cheering for Germany. Either way, there will be plenty of friendly competition within the Hyundai Motorsport facility throughout June and July. President of Hyundai Motorsport, G. H. Choi, said: “The combination of FIFA World Cup and FIA World Rally Championship offers Hyundai a tremendous opportunity to open up our brand to a truly international audience. Through our sponsorship of the FIFA World Cup, we are pleased to invite fans to share the joy of the tournament through our popular Hyundai Fan Parks. 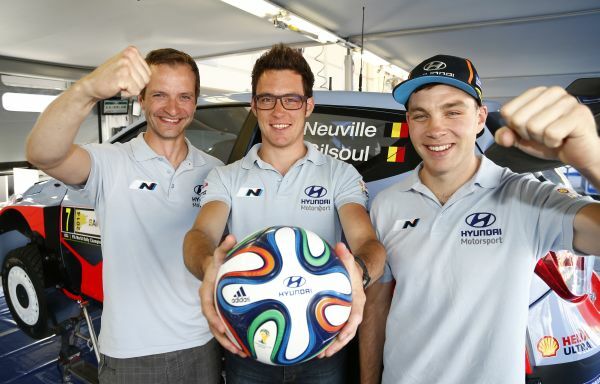 Hyundai Motorsport driver Thierry Neuville said: “The FIFA World Cup is understandably one of the most popular sporting events in the world and we all like to get behind a particular team, normally our home nation. It is a very special year for Hyundai with involvement in the World Cup as well as the World Rally Championship. There are many similarities between the two in that they are both global events that attract passionate fan support. The Hyundai Fan Parks are a fantastic way for football fans to enjoy the exhilaration and excitement of the World Cup, which is a very similar experience to the fans’ experience of WRC events.